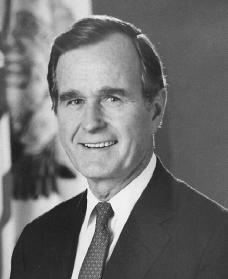 George Herbert Walker Bush was born on June 12, 1924, in Milton, Massachusetts. His parents, both from prominent Wall Street families, were Prescott and Dorothy Walker Bush. Prescott Bush served as a U.S. senator from Connecticut from 1952 to 1962. George Bush grew up in the wealthy New York City suburb of Greenwich, Connecticut, vacationing in the summers in Kennebunkport, Maine. As a boy Bush attended exclusive private schools where he excelled both in the classroom and on the athletic field. After graduating from Phillips Academy in 1942, he enrolled in the U.S. Navy Reserve. Bush was assigned as a navy flight pilot in 1943, serving until the end of World War II (1939–45). Meanwhile, he had become secretly engaged to Barbara Pierce, and the couple married on January 6, 1945, in Rye, New York. The Bushes became the parents of six children, one of whom died of leukemia (a blood disease) when she was three years old. After the war, Bush enrolled at Yale University in September 1945. An ambitious and highly competitive student, he earned a degree in economics within three years. Although a married military veteran, Bush was active in campus social and athletic activities. He played three years of baseball and eventually captained the team. Following graduation in 1948, Bush became an oilfield supply salesman in Odessa, Texas. Rising quickly in an industry that was experiencing a postwar boom, Bush started his own oil and gas drilling firm in 1953. After merging with another firm in 1955, Bush moved the corporate headquarters to Houston, Texas, in September 1958.
the People's Republic of China, and backed cuts in foreign spending. Bush lost the election. Despite the loss, Bush did not withdraw from politics. In 1966 he won election to the House of Representatives from a Houston suburban district, and became a two-term congressman, serving from 1966 to 1970. While in Congress, Bush supported a "freedom of choice" alternative to school desegregation. (Desegregation was the process of putting people of different races together to end policies of segregation, which had kept races separate.) Bush also supported the major issues of President Richard Nixon (1913–1994), including the Family Assistance Plan (a program to help needy people by giving them a minimum amount of money while requiring them to look for or keep jobs), during 1969 and 1970. In 1970 Bush again ran for senator and was again defeated. As a reward for his loyalty, President Nixon appointed Bush U.S. ambassador to the United Nations in February 1971. Given Bush's lack of foreign-policy experience, some viewed this appointment as a political favor. Bush, however, proved to be able and popular in the position, particularly in his handling of difficult situations involving countries in the Far East. In December 1972, at Nixon's request, Bush gave up his position as ambassador of the United Nations to accept the post of chairman of the Republican National Committee. This appointment turned out to be a demanding assignment when the Senate, in the spring of 1973, began a highly publicized investigation into the so-called "Watergate Affair." Named for the Washington, D.C., complex in which it took place, the Watergate scandal involved burglary and illegal recordings of Nixon's opponents during the 1972 presidential election. Nixon's personal involvement was eventually exposed. In early 1973, Bush was involved in the House debates about whether or not to impeach (to try a U.S. public official in the U.S. Congress for misconduct in office) President Nixon. Bush publicly supported the president and questioned the motives of the president's political enemies. Following Nixon's decision to leave office in August 1974, Bush was assigned to head a U.S. relations office in Peking, China. Bush remained as the head of the U.S. relations office in Peking until December 1975. The following month he accepted appointment as director of the Central Intelligence Agency (CIA). At the time, the CIA was viewed unfavorably by the American public. Bush actively tried to restore morale within the agency and to deflect criticisms of the agency's past role and authority. In 1977, Bush resigned as director of the CIA and returned to Houston to become chairman of the First National Bank of Houston. Soon after his return to Texas, Bush began campaigning for the Republican presidential nomination of 1980. Using the contacts he made while in Washington, Bush traveled the country with his family, establishing his own fund-raising organization. After formally announcing his candidacy in May 1979, he quickly emerged as the principal opponent of Ronald Reagan (1911–), the Republican frontrunner and former governor of California. However, Bush's failure to find a major issue that would set him apart from his opponent ended his presidential hopes. In a surprise decision, Reagan chose Bush as his vice presidential running mate. With Reagan's decisive victory over Democratic president Jimmy Carter (1924–) in 1980, Vice President Bush proved to be a loyal, hardworking supporter of the president. Renominated in 1984, Bush retained the vice presidency with yet another Reagan landslide victory. In 1988, Bush defeated Massachusetts governor Michael Dukakis (1933–) to become the forty-first president of the United States. With this victory, many felt he had overcome his weak image as a leader. The world began changing rapidly during Bush's presidency. The Cold War, which had raised tensions between Eastern and Western nations since the 1950s, came to a halt when the Communist governments of the Soviet Union and eastern Europe fell. America's crushing defeat of Iraq in the Persian Gulf War (1990–91), which resulted in the removal of Iraqi troops from Kuwait, also boosted Bush's popularity. As president, Bush also had his share of problems. Many historians believe that Bush ran a negative campaign in 1988 that affected his ability to govern the country and gain the trust of the American people. Other critics said he lacked vision and leadership. He also had a relatively inexperienced vice president in former Indiana senator Dan Quayle (1947–). In 1992, with the country in the midst of a recession (a slowdown in economic activity), he lost his reelection to Democrat Bill Clinton (1946–). In retirement, has Bush kept a relatively low profile, preferring to travel and spend time with his grandchildren. In March 1997, at the age of seventy-two, he became (many believe) the first American president to jump out of an airplane. He also cowrote A World Transformed, a personal account of his dealings with foreign policy during his time as president. In November 1997 the George Bush Presidential Library and Museum opened on the campus of Texas A&M University, in Col lege Station, Texas. It is the tenth presidential library overseen by the National Archives and includes information covering Bush's long public career—from ambassador to world leader. Located within the complex is the George Bush School of Government & Public Service, which will provide graduate educa tion to those who wish to lead and manage organizations serving the public interest. Electing to stay mainly in the back ground, Bush watched as his son, George W. Bush, became president in the 2000 election, one of the closest presidential races in history. Hill, Dilys M., and Phil Williams, eds. The Bush Presidency: Triumphs and Adversities. New York: St. Martin's Press, 1994. Burr, Aaron Bush, George W.